Conflict with the House of Lords had been caused by Lloyd George's, People's Budget. He had been a long opponent of the Poor Law in Britain. He was determined to take action that in his words would "lift the shadow of the workhouse from the homes of the poor". He believed the best way of doing this was to guarantee an income to people who were to old to work. Based on the ideas of Tom Paine that first appeared in his book Rights of Man, Lloyd George's proposed the Old Age Pensions Act in his first budget presented on 29th April, 1909. 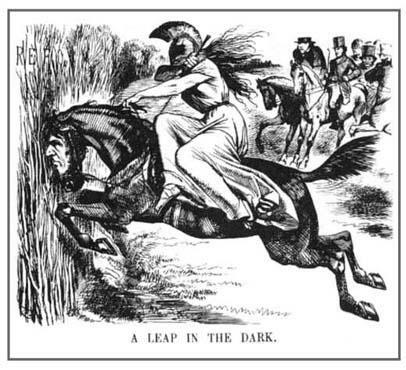 Lloyd George was wrong about Britain leaving the "Dark Ages" and "emerging into the light". Although he had the support of the Labour Party, whose policy since its formation in 1900, was the abolition of the House of Lords, H. H. Asquith wanted to continue with the system, with the expectation that in time, the Liberal Party, would gain control of the House of Lords. Politicians often talk about Britain being the home of democracy. In fact, we are one of the only advanced countries in the world without a fully-functioning democracy. The reasons for this can be found in the way our political institutions have developed over the last thousand years. 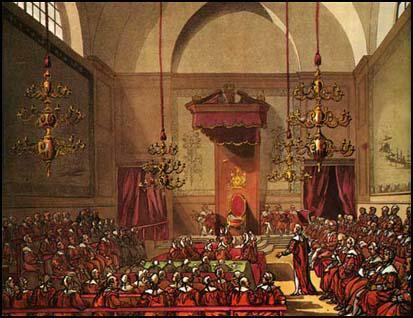 This established what became known as the House of Lords. The power of Parliament depended on the strength of the monarchy and the demands they made on the people. In 1275 Edward I called a meeting of Parliament (parler was Norman French for talk). As well as his tenants-in-chief, Edward invited representatives from every shire and town in England. These men were elected as representatives by the people living in the locality. When the representatives arrived they met in five different groups: (1) the prelates (bishops and abbots); (2) the magnates (earls and barons); (3) the inferior clergy; (4) the knights from the shires; (5) the citizens from the towns. Whenever the king needed money, he called another Parliament. In 1430 an Act of Parliament divided constituencies (voting districts) into two groups: counties and boroughs. Only males who owned property worth 40 shillings were allowed to vote in county constituencies. You had to be fairly wealthy to be a MP. Not only were MPs not paid a wage, they also had to have an annual income of £600 (£300 for borough MPs). Henry VIII enhanced the importance of Parliament by his use of it during the English Reformation. In 1547 the king gave permission for members of the commons to meet at St. Stephen's Chapel, in the Palace of Westminster. In the 15th century the House of Lords was the Upper House and the House of Commons the Lower House. The next constitutional crisis emerged during the English Civil War. In 1646 John Lilburne, John Wildman, Richard Overton and William Walwyn formed a new political party called the Levellers. 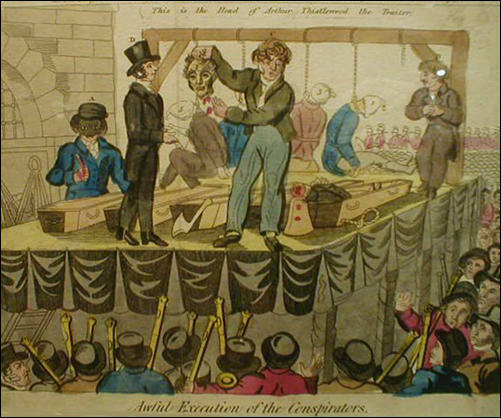 Their political programme included: voting rights for all adult males, annual elections, complete religious freedom, an end to the censorship of books and newspapers, the abolition of the monarchy and the House of Lords, trial by jury, an end to taxation of people earning less than £30 a year and a maximum interest rate of 6%. Some members of the House of Commons sent messages to Holland inviting James's daughter, Mary and her husband, William, Prince of Orange to come to England. Mary and William were told that, as they were Protestants, they would have the support of Parliament if they attempted to overthrow James. The ratio of MPs to population fluctuated wildly. A rotten borough was a parliamentary constituency that had declined in size but still had the right to elect members of the House of Commons. Plympton Earle had been a prosperous market town in the Middle Ages but by the 18th century it had declined to the level of a country village. Newtown on the Isle of Wight had been a market town but was now reduced to a village of 14 houses. Thomas Spence was a schoolmaster from Newcastle. Spence was strongly influenced by the writings of Tom Paine. 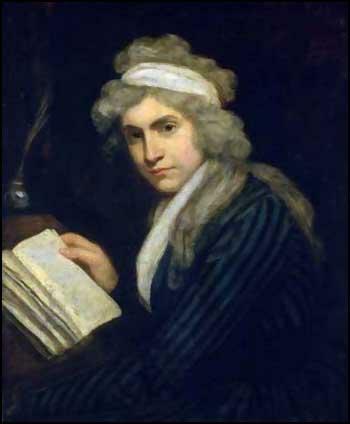 and in December 1792 Spence moved to London and attempted to make a living by selling the works of Paine on street corners. He was arrested but soon after he was released from prison he opened a shop in Chancery Lane where he sold radical books and pamphlets. By the early 1800s Thomas Spence had established himself as the unofficial leader of those Radicals who advocated revolution. James Watson, was one of the men who worked very closely with Spence during this period. Spence did not believe in a centralized radical body and instead encouraged the formation of small groups that could meet in local public houses. At the night the men walked the streets and chalked on the walls slogans such as "Spence's Plan and Full Bellies" and "The Land is the People's Farm". 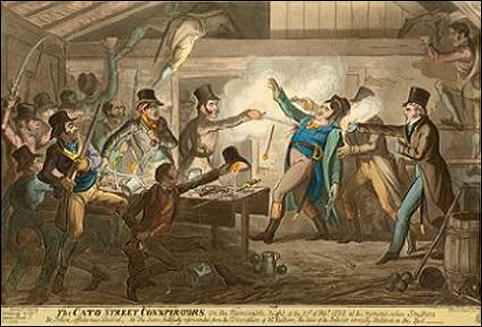 In 1800 and 1801 the authorities believed that Spence and his followers were responsible for bread riots in London. However, they did not have enough evidence to arrest them. A Stamp Tax was first imposed on British newspapers in 1712. The tax was gradually increased until in 1815 it had reached 4d. a copy. As few people could afford to pay 6d. or 7d. for a newspaper, the tax restricted the circulation of most of these journals to people with fairly high incomes. During this period most working people were earning less than 10 shillings a week and this therefore severely reduced the number of people who could afford to buy radical newspapers. "(1) A vote for every man twenty-one years of age, of sound mind, and not undergoing punishment for a crime. Lloyd George returned to the arguments made by William Gladstone about the dangers being posed by Germany. The 1871 Constitution of the German Empire gave citizens representation on the basis of elections by direct and equal suffrage of all males who had reached the age of 25. 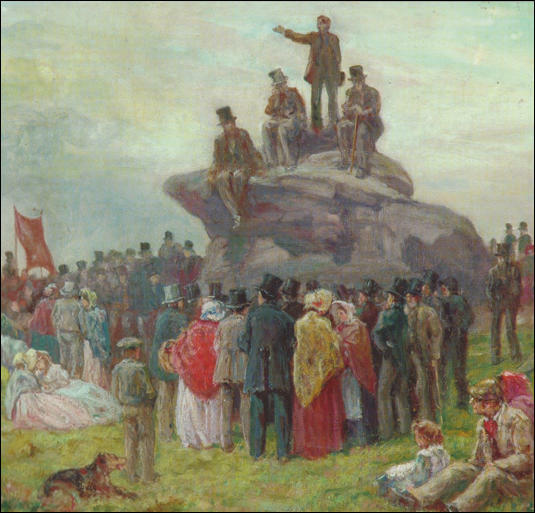 Influenced by the ideas of Karl Marx, the German Social Democratic Party (SDP) was formed in 1875. In the 1877 General Election in Germany the SDP won 12 seats. This worried Otto von Bismarck, and in 1878 he introduced an anti-socialist law which banned Social Democratic Party meetings and publications. However, the German government knew that to prevent revolution they needed to pass legislation that favoured the working-classes. For example, in 1889, Germany became the first nation in the world to adopt an old-age social insurance program. According to one historian: "Bismarck was motivated to introduce social insurance in Germany both in order to promote the well-being of workers in order to keep the German economy operating at maximum efficiency, and to stave-off calls for more radical socialist alternatives. Despite his impeccable right-wing credentials, Bismarck would be called a socialist for introducing these programs." The negotiated settlement in 1911 meant that an unelected second chamber remained and undermined the idea that Britain is a democracy. 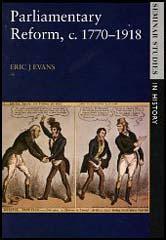 Britain also holds onto the archaic "first past the post" system that dates back to the duopoly (a two-party dictatorship) of the Whigs and Tories of the 18th century. These groups were replaced by the Conservatives and Liberals in the 19th century. After the working-classes got the vote Labour replaced the Liberals. Only Britain and its former colonies (including the USA and Canada) have such a system. The 1945 Labour government made further reforms. The Parliament Act 1949, enabled the Commons (in exceptional circumstance) to pass legislation without approval from the Lords but subject to certain time delays. In effect, they give the House of Lords the power to delay legislation but not to prevent it. This legislation reduced the suspensory veto to two sessions and one year. In the 1997 General Election, the Labour Party manifesto stated: "The House of Lords must be reformed. As an initial, self-contained reform, not dependent on further reform in the future, the right of hereditary Peers to sit and vote in the House of Lords will be ended by statute". Tony Blair won a landslide victory: Labour (418), Conservative (165), Liberal Democrats (46). However, in the first year of his administration the House of Lords rejected government bills 38 times. In 1999 the Labour government passed the House of Lords Act. The Act decreased the membership of the House from 1,330 in October 1999 to 669 in March 2000. The majority of the Lords were now life peers but Blair did permit ninety-two hereditary peers to remain in the House on an interim basis. Another ten were created life peers to enable them to remain in the House. There are currently over 800 members of the House of Lords. This makes it the largest parliamentary chamber in any democracy. It is surpassed in size only by China’s National People’s Congress (2,987 members). Only Russia of the developed nations allows a significant role for unelected politicians, and the UK finds itself in the company of states such as Belize, Lesotho, Madagascar, Oman and Saudi Arabia with having an unelected parliamentary chamber. The current political make-up of the House of Lords is: Conservative (253), Labour (201), Liberal Democrats (102), Crossbenchers (175), Bishops (25), UK Independent (3), Green (1) and Plaid Cymru (1). Members of the House of Lords can opt to receive a £300 per day attendance allowance, plus travel expenses and subsidised restaurant facilities. In fact, they receive this money for just signing an attendance book. According to Baroness Frances D'Souza, a peer kept a taxi waiting outside the House of Lords so he could dash inside to qualify for his daily allowance. She added that many peers "contribute absolutely nothing" and attend only to take advantage of the daily attendance allowance. After the Labour Party was formed in 1900, at every national conference, resolutions were passed calling on the need to abolish the House of Lords. However, leaders of the party, once in power, always lost interest in this measure, as they saw it as a retirement home for their colleagues. The passing of the 1999 House of Lords Act has reduced hostility towards this undemocratic institution. According to the leak from Labour's manifesto for the 2017 General Election it seems that Jeremy Corbyn has plans to create a democratic second chamber. Our "first past the post" system makes the emergence of new parties that can gain power virtually impossible. Whereas new political forces have emerged in the rest of Europe (they all use proportional representation systems) that reflect the disillusionment with recent economic developments, Britain remains under the control of the two political parties that have failed us so badly over the last 40 years. It is about time that we enjoyed two political chambers that represented the true political feelings of the public.